Irving, David K. (2011). Elements of College Teaching. Atwood Publishing. 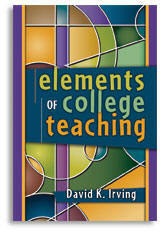 The aim of David K. Irving’s The Elements of College Teaching is to provide new and seasoned teachers with a comprehensive guide to the basic elements of teaching in colleges and universities. A “how-to” book is a useful resource in teaching and learning circles, however, it is important to note that the scope of Irving’s text is more fruitful for those new to the teaching profession. First-time teachers entering colleges and universities would benefit from the information contained in Irving’s book as he provides concise guidelines on how new teachers can develop assignments, prepare for classes, and evaluate student performance. In this way, the contents of the book will age gracefully given that, for new educators, The Elements of College Teaching would remain a useful beginner’s guide to navigating the higher educational teaching experience. In reviewing this book as a “how-to” guide for beginner teachers, it must be said that a shortcoming of this resource is its lack of examples. That is, although Irving uses personal anecdotes to frame the basic instructions on how to create a syllabus or grading rubric, a new teacher would better profit from examples of a well-constructed syllabus or grading rubric. Despite the limitations to the text, The Elements of College Teaching will serve as a practical resource for new university and college faculty who are without departmental training or professional development support.